The 7 Cs of communication is a checklist we can use to ensure that we are communicating effectively. Communication is something we do almost from the moment we are born. As a baby, we communicate effectively by crying when we are unhappy about something. As a young child, we are already communicating with those around us before we even begin school. Communication is a core part of the experience of being human. But because we learn to communicate in childhood many of us never revisit the topic and learn the communication skills needed for really effective communication. Think about all the misunderstandings that you have witnessed in your professional life. The misunderstandings you’ve witnessed probably number in the thousands. A classic and all too common misunderstanding in an organizational context is illustrated by the following example. Micha askes Mike to produce a report showing the sales figures for the year. Mike then produces the report showing the figures from January 1st to the current date. However, this isn’t quite what Micha wanted. What Micha actually wanted was the sales figures for the past 12 months. This misunderstanding between Micha and Mike means Micha now has to speak with Mike again to explain what she really wanted. It also means Mike has extra work to do as he needs to revisit and redo his report. Stop for a moment and think about all the communication you do in a single day. Emails. Conference calls. Team meetings. Presentations. One to one meetings. Even casual chats by the coffee machine. The number of communications you send and undergo in a single day can easily number in the hundreds. Though effective communication you can avoid misunderstandings. Avoiding misunderstandings saves you time. Thus, you can give your productivity a huge boost by sharpening up your communication skills to reduce misunderstandings. Let’s examine each of the 7 Cs of Communication in turn. Begin every message by asking the question, “What is the purpose of this communication?”. 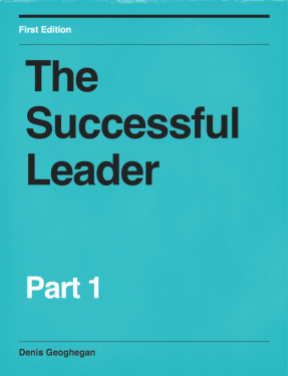 This will enable you to make the objective of your communication clear to the recipient. If you’re not sure what the purpose of your communication is, then the chances are that your recipient won’t be either. Clarity is also about avoiding the use of complex words, sentences, and fuzzy language. Why use 10 sentences to explain something when a single sentence will suffice. Being concise will save time for both you and the receiver of your message. To help make your communications more concise, avoid going over the same point several times, and avoid the use of filler words, sentences, and over wordy expressions. Although we are trying to be concise, it is important to remember that we are not trying to lose completeness. Concrete communication is about being specific and clear rather than vague, obscure, and general. To be more concrete use sentences that cannot be misinterpreted. Include supporting facts and figures to underscore your message, but don’t allow anything that detracts from the focus of your message. Your facts and figures are correct. You are using the right level of language. Being correct first time will both save you time and boost your credibility. A correct message will also have a greater impact on the recipient than an incorrect one. Does your message make sense? Does it flow logically from one sentence to the next? Check that each sentence flows logically from one to the next. Check that you haven’t tried to cover too many points or been distracted by side issues. Your message must contain all the necessary information to achieve the desired response. To ensure that your message is complete think about questions the receiver might think of as they receive your message. Address these questions. Ensure you have included a call to action so that your audience knows exactly what you expect them to do next. Be polite. You’re more likely to get what you want from your communication if you are courteous, as courtesy builds goodwill. Check that your message is polite, shows respect for the feelings of the receiver, and is tactful. 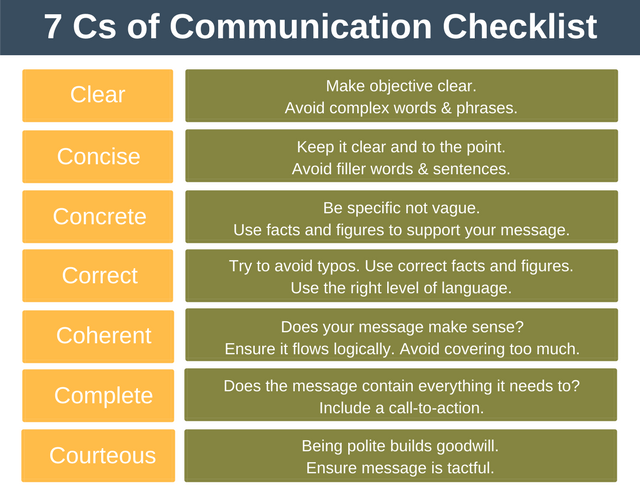 The 7 Cs of Effective Communication is essentially a checklist which can help us communicate more effectively. 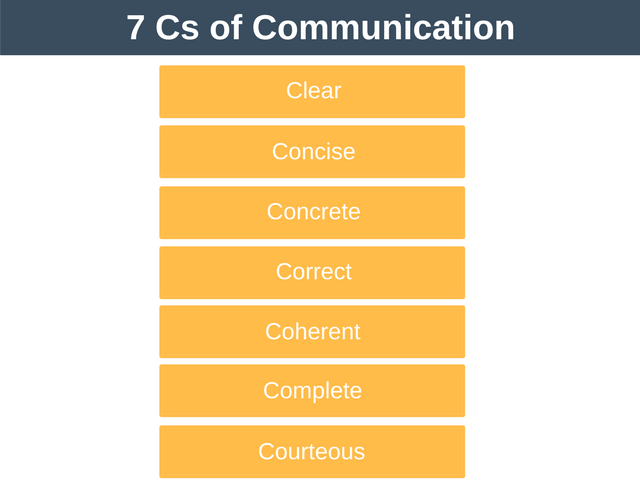 If you use the 7 Cs checklist the next time you need to communicate then you know you’ll be delivering the clearest message you can. This will reduce misunderstandings, boost your credibility, and ultimately make you more productive by saving you time.